I booted up the latest dev copy, and my settings for emulated wiimote and nunchuck mapped to a DS4 do not respond. 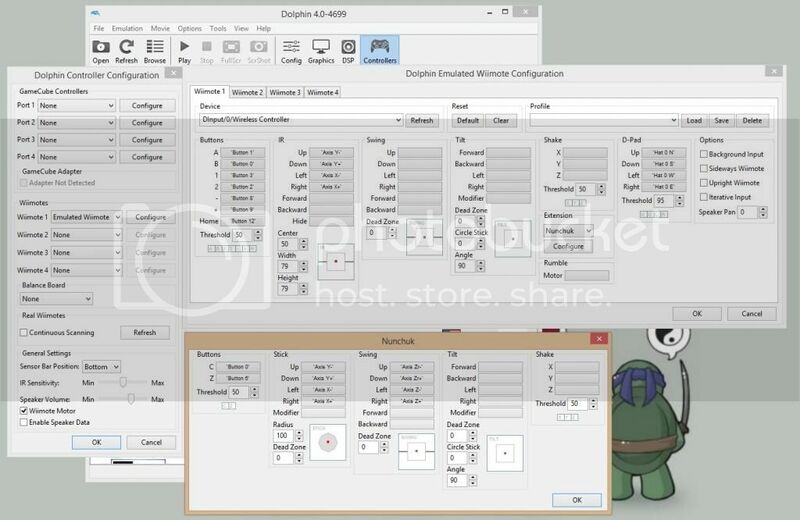 The wiimote part does fine, but it seems as though Dolphin doesn't even register the emulated nunchuck. Metroid Prime Trilogy just keeps telling me a nunchuck is required. These settings used to work, but now they seem to be broken. Do I have to active something to get Dolphin to emulate a nunchuck properly again? These are my exact settings. They worked splendidly on 4.0.2. Emulated classic controller works perfectly as well, so I'm not sure why the nunchuck is having a problem. Have you tried enabling background input? (12-21-2014, 10:32 AM)KHg8m3r Wrote: Have you tried enabling background input? I hadn't previously. I tried it now, but unfortunately it did not work. Is there any reason why some extensions (classic controller) would work but the nunchuck wouldn't?